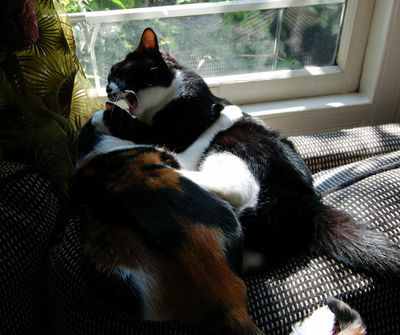 Cat fights accompanied by injuries are common, particularly in cats that go outdoors or live there. Since cats have an enormous amount of bacteria in their mouths, bites can be serious, often developing into severe infections and abscesses. The wounds usually heal quickly, scabbing over, leaving no exit route for the bacteria. The white blood cells the body sends out to fight infection and the bacteria form pus pockets which are abscesses. Besides infections, cat bites can transmit other diseases to each other such as rabies, feline leukemia (FeLV) and feline immunodeficiency virus (FIV), bartonellosis among them. Bartonellosis or cat scratch fever and rabies are zoonotic diseases meaning that cats can transmit them to humans. It sometimes difficult to tell if a cat has been bitten and may take 2-4 days before the cat shows any symptoms such as fever, inappetance and lethargy. If your cat goes outdoors, it’s a good idea to check for any wounds when s/he comes back inside. Try to keep the cat calm and quiet. Spread the fur to see more clearly. If you discover a wound, clip the fur surrounding it. Wash the wound with the 3% peroxide you have in your First Aid Kit. Don’t cover the wound unless it’s bleeding excessively. Use sterile gauze pads or any clean cloth and press on the wound to help stop bleeding. Continue applying pressure, adding pads as needed, but since the wound may need stitches, immediately contact your veterinarian or take your cat to the nearest animal emergency clinic. In any case, it’s a good idea to have your vet examine any wounds and make the judgment whether stitches or any other treatments are necessary. Your vet may prescribe antibiotics to prevent infection. If stitches are necessary or your cat has an older wound or abscess, your vet may have to anesthetize your cat and incise the wound and clean it. Your vet will give you further instructions for home care. 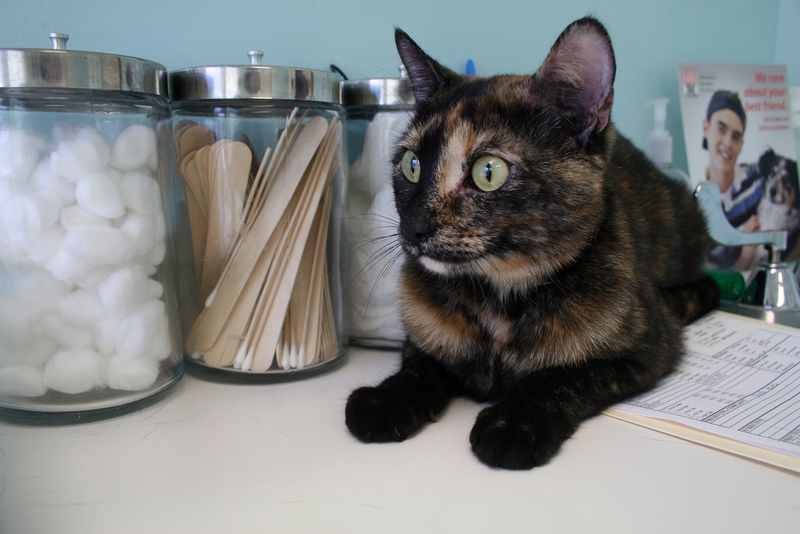 It’s important for all cats, but particularly for those that go outdoors to keep up-to-date on rabies vaccinations.